Raymond R. "Buzz" Wright was born in Moriah, NY, December 5, 1945, the son of John and Elizabeth (Reed) Wright. He was the 11th of 13 children (11 boys and two girls). Buzz attended school in Mineville where he was well-liked by his classmates who gave him the nickname which stayed with him throughout his adult life. Hunting, fishing and playing cards were among his favorite pastimes. Buzz was employed by the New York State Department of Transportation. Drafted into the Army in 1965, he served two years, discharged late in 1967. During his tour of duty in Vietnam, Buzz engaged the enemy in a combat mission whereby his actions and heroism earned him the nation's highest award for military valor - the Congressional Medal of Honor. He was decorated in a ceremony at Washington DC the following year. 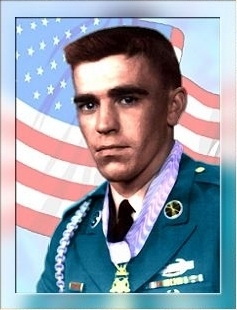 Medal of Honor: WRIGHT, RAYMOND R.
Rank and organization: Specialist Fourth Class, U.S. Army, Company A, 3d Battalion, 60th Infantry, 9th Infantry Division. Place and Date: Ap Bac Zone, Republic of Vietnam, 2 May 1967. Citation: For conspicuous gallantry and intrepidity at the risk of his life above and beyond the call of duty. While serving as a rifleman with Company A, Sp4c. Wright distinguished himself during a combat patrol in an area where an enemy ambush had occurred earlier. Sp4c. Wright's unit suddenly came under intense automatic weapons and small-arms fire from an enemy bunker system protected by numerous snipers in nearby trees. Despite the heavy enemy fire, Sp4c. Wright and another soldier leaped to the top of a dike to assault the position. Armed with a rifle and several grenades, he and his comrade exposed themselves to intense fire from the bunkers as they charged the nearest one. Sp4c. Wright raced to the bunker, threw in a grenade, killing its occupant. The 2 soldiers then ran through a hail of fire to the second bunker. While his comrade covered him with his machinegun, Sp4c. Wright charged the bunker and succeeded in killing its occupant with a grenade. A third bunker contained an automatic rifleman who had pinned down much of the friendly platoon. While his comrade again covered him with machinegun fire, Sp4c. Wright charged in and killed the enemy rifleman with a grenade. The 2 soldiers worked their way through the remaining bunkers, knocking out 4 of them. Throughout their furious assault, Sp4c. Wright and his comrade had been almost continuously exposed to intense sniper fire from the treeline as the enemy desperately sought to stop their attack. Overcoming stubborn resistance from the bunker system, the men advanced into the treeline forcing the snipers to retreat, giving immediate chase, and driving the enemy away from the friendly unit so that it advanced across theo pen area without further casualty. When his ammunition was exhausted, Sp4c. Wright returned to his unit to assist in the evacuation of the wounded. This 2-man assault had driven an enemy platoon from a well prepared position, accounted for numerous enemy casualties, and averted further friendly casualties. Sp4c. Wright's extraordinary heroism, courage, and indomitable fighting spirit saved the lives of many of his comrades and inflicted serious damage on the enemy. His acts were in keeping with the highest traditions of the military service and reflect great credit upon himself and the U.S.Army. Buzz was a member of the U.S.Congressional Medal of Honor Society, and Mineville Veterans of Foreign Wars, Post 5802. Raymond R. Wright passed away September 24, 1999. He is buried at Section 7 Site 1035 in Gerald B. H.Solomon Saratoga National Cemetery, Schuylerville, New York.